Eucalyptus, also known as Eucalyptus globulus, is native to Tasmania and Australia. Manufacturers extract and distill the medicinal oil from the leaves of this tall evergreen tree. Many species of eucalyptus exist, varying from very large trees to small shrubs. The most commonly used medicinal eucalyptus plant is the Australian fever or blue gum tree. The leaves of this tree grow between 4 and 12 inches and are dark green with a shiny appearance and aromatic fragrance. While eucalyptus oil is considered safe, talk to your doctor before using it for any purpose while pregnant. The use of eucalyptus originated in Australia, where indigenous people used it to ease joint pain and heal skin problems. Early European botanists eventually discovered the many benefits of this Australian evergreen plant. In England during the 19th century, hospitals used eucalyptus oil to clean urinary catheters. Today many people around the globe use the oil from the eucalyptus plant as an effective remedy to reduce symptoms associated with the common cold and flu. Eucalyptus oil contains a compound called eucalyptol, which is responsible for its medicinal effects. Eucalyptol has antiseptic and anti-inflammatory properties, making it effective against fungi, bacteria and viruses. According to the University of Maryland Medical Center, this aromatic oil also contains tannins, which may help reduce inflammation, and flavonoids, which have antioxidant properties. You may find yourself coming down with the sniffles during your pregnancy. 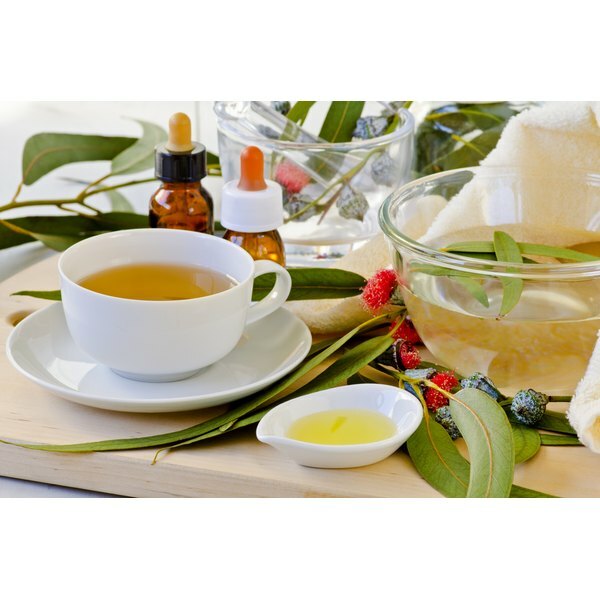 According to the University of Maryland Medical Center, eucalyptus oil may provide natural relief for nasal and chest congestion associated with colds, flu and bronchitis. The oil's antiseptic property makes it effective against infections, protecting your immune system during cold and flu season. Furthermore, eucalyptus can reduce coughing, treat bronchitis and reduce skin inflammation such as sores, boils and wounds. You can use eucalyptus oil in a number of different ways. For a steam inhalation, bring 2 to 3 cups of water to a boil on the stovetop. Remove from heat and add a few drops of eucalyptus oil to the water. Sit comfortably at the table, place your head over the pot and cover your head with a towel as you gently inhale the vapors. You can also add 2 to 3 drops of eucalyptus oil to a warm bath and soak as you inhale the vapors and allow the oil to soothe your aching muscles and joints. As with any supplement, herb or medication, always consult with your health care provider prior to using eucalyptus oil during pregnancy. According to Noreen Kassem, M.D., eucalyptus oil is considered safe when used as directed. Do not apply undiluted essential oils directly to your skin or inhale them undiluted. Futhermore, when choosing a eucalyptus oil product, choose one that is organic and at least 70 percent eucalyptol.